We have case when some of our users feedback that they do not see Change Status, Change Owner, Add to Campaign button in Lead list View. While some other users able to see that buttons. So, what is the caused? Add to Campaign - to see this button, user need to be Marketing User in user detail and also have Edit permission in Campaign object, this is also applicable for Contact list View. On separate note, for custom object, user with Modify All permission for that object will see Change Owner button in the list view. 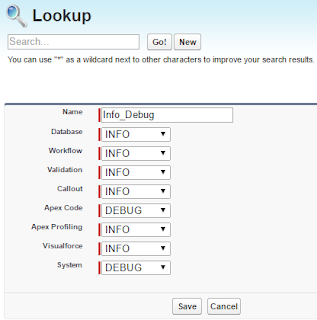 Salesforce: How to delete Debug Level in Salesforce? 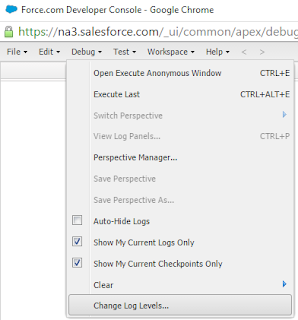 In previous blog, we discussed about using Debug Log to troubleshoot workflow in Salesforce. 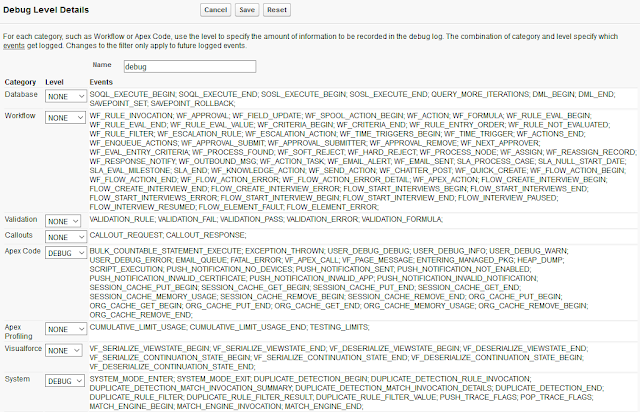 A debug log records database operations, system processes, and errors that occur when executing a transaction or while running unit tests. The system generates a debug log for a user every time that user executes a transaction and the user has a trace flag with start and expiration dates that contain the transaction's start time. 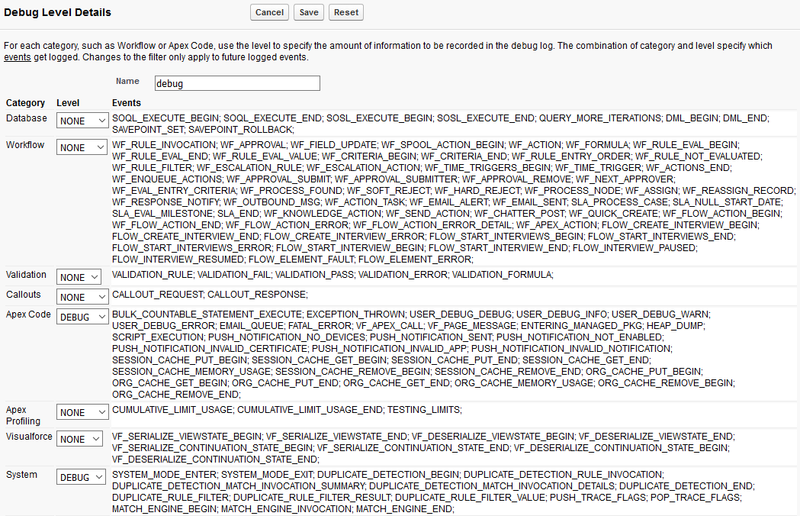 When you add user to trace for debug, you have to select an existing Debug Level or create a new Debug Level. 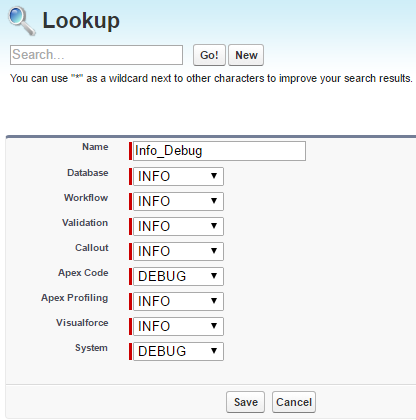 To add new Debug Level, click New button in Debug Level lookup window. You can modify existing debug level by click Debug Level name, then adjust debug level for each Category. Workflow is the most favorite tool available for Salesforce admin for automation (before Process Builder born), even after Process Builder available, workflow still favorite by Salesforce admin because of the simplicity. However, when you have a lot of workflows in the same object, sometimes it become too complex to troubleshoot when workflow do not action as it suppose to. 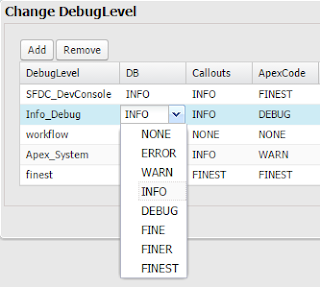 One of the easiest option to troubleshoot workflow is using Debug Log, navigate to Setup | Logs | Debug Logs. You need to define Traced Entity (in this case, select User), Start Date Time, Expiration Date Time, and Debug Level (choose finest). Lesson learn from this scenario: inactive workflow will not be evaluated at all. All above samples before (7), we use criteria are met in the workflow rule criteria, but in (7), we use formula evaluates to true - note the difference in highlighted debug log above. 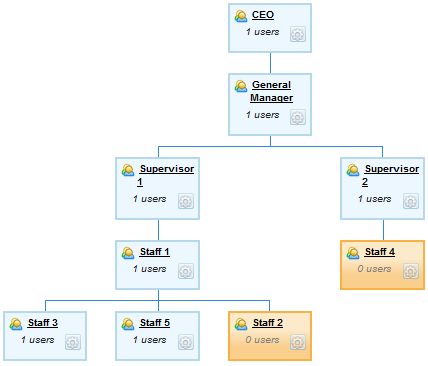 In Salesforce, we can define Role Hierarchy and Manager for a user. In many cases, Manager is the same user with the user defined one role above on the Role Hierarchy. But, it does not always have to follow Role Hierarchy. Manager can be someone from other role hierarchy. 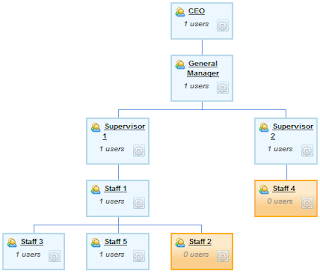 The most important, out of the box - there is NO direct relationship between Manager with Role Hierarchy, so do not expect when you change role hierarchy of a user, the Manager will be auto changed. 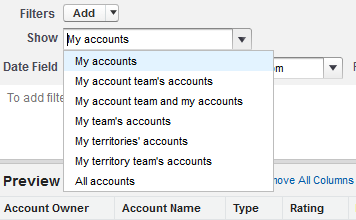 Salesforce offers user role hierarchy that can be use for sharing settings. 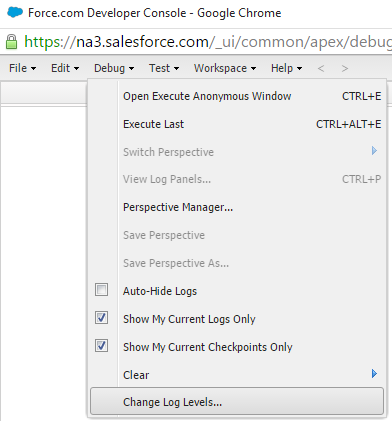 This is to determine the levels of access that users have in Salesforce. This define user permission to access a record, usually user in higher role hierarchy have the ability to read, update and change record owner of records owned by users below the role hierarchy. Role hierarchy also determine report generated when user run report configured for My team. 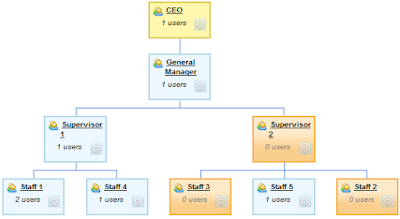 Dynamic Dashboard would be the other usage of role hierarchy, user only able to user in below role hierarchy as running user. This field is especially useful for approval processes workflow. example: A report to B, so B cannot report to A.
example: A report to B, B report to C, so C cannot report to A. Side Note: the same logic applied when you set parent and child Accounts. Previous blog discussed about reports related to Account Team, this blog is the continuation discussed on Opportunity Team. If your company practice team selling, you can enable Opportunity Team in Salesforce from Setup | Customize | Opportunities | Opportunity Teams | Opportunity Team Settings, then select Enable Team Selling. When running an opportunities report, you have several choices in the standard filter area that allow you to choose what types of records should be searched. Once Opportunity Team Selling feature enabled, you will have additional options when running Opportunity report. ONLY the opportunities you OWNED. ONLY the opportunities where you are on the SALES TEAM. Opportunities OWNED by you & opportunities where you are on the SALES TEAM. Opportunities OWNED by you & users who report to you in the role hierarchy. Opportunities OWNED by you & users that report to you in the role hierarchy, ALSO opportunities where you & users who report to you in the role hierarchy are on the SALES TEAM. ALL opportunities visible by the user who run the report. Note: When Opportunity Split enabled, opportunity owner will be automatically added into Opportunity Team with role = Opportunity Owner, read this blog. If you would like to report on Account Team in Salesforce, there is a Report Type provided by Salesforce. When you create new report, look for Account with Account Teams report type. The difference with standard Account report type, this report type have information of Account Team Name (which is user name) and Team Role, but it must have Account Team, otherwise the Account will be not in the report generated. 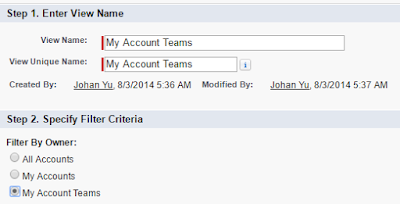 Account Team is child object of Account, so if there are multiple Account Team for an Account, it will show as multiple row for each Account Team in Tabular report. 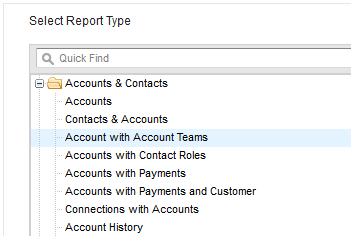 In Account report type, there are 4 options (not include All), while for Account Team report type, there are 5 options to show (not include All). 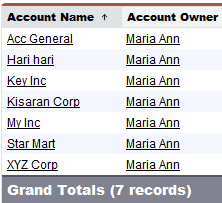 My accounts: ONLY accounts you OWNED. ** My Inc is the only account owned by Maria Ann with Account Team, it shown as 3 rows because of there are 3 Account Team (user) for that Account. My accounts team's accounts: ONLY accounts where you are on the Account Team. ** Maria Ann is the Account Team in this 2 accounts. My accounts team and my accounts: Accounts you OWNED & accounts where you are on the Account Team. 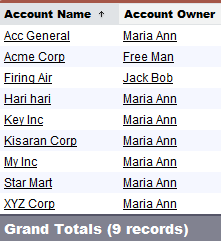 My team's accounts: Accounts you OWNED & accounts owned by all of your subordinates in the role hierarchy. 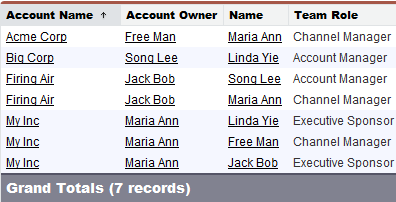 ** this is all accounts owned by Maria Ann and her subordinates. Compare the same report run by Jack Bob - the CEO. ** Big Corp and Firing Air is not here because neither owner and Account Team owned by Free Man (and his subordinates - none in this case). My Inc will show 3x although only 1 Free Man there, but this is look from My Inc perspective with the Account Team.